Raising kids can be the most intense roller coaster ride of your life. It’s a, “please hold onto the bar” kind of experience. There are ups and downs for sure. Just like anything, there are certain ‘tips’ that can make the experience a little less jarring and the outcome (hopefully) more pleasant. One of these ‘tips’ in the rollercoaster of parenting is consistency. Allow me to say it again, consistency. Whether it be on your end or between you and your spouse raising your child, consistency is critical. The power of consistent parenting, rules and our dialogue hold great weight. I’ve witnessed inconsistent parenting weaken the foundation of rule enforcement, respect and quality of the parent-child relationship. Guess what? No one is perfect. You are going to screw up as a parent, but there are a few kernels of parenting wisdom that are uber important in sticking to. Two, in particular, that go to the core of our kids. They are watching, listening and absorbing. If you don’t think they are, you’re wrong. ‘I Promise’– I urge parents, aunts, uncles, grandparents to choose their words super duper carefully. Saying, “I promise,” is a big word that holds tremendous weight with our kids emotions. When we ‘promise’ to go practice throwing a ball in the backyard after dinner, to help with that homework assignment, to go fishing, watch that movie or the thousandth other things we were asked to do in the middle of making dinner, driving to practice, etc. When we say, “I promise,” it is ironclad. We are sign, seal delivering on something 100%. As humans, there’s nothing 100% about us. After the 100th failed “I promise” comes out of their lips the up and down transfers into resentment and distrust. They no longer view you as reliable and this can do some super damage to the relationship you have or will have with them. They need to be able to trust us, rely on us and “I promise” comes with great cost when there is lack of follow through. It causes aching hearts and builds emotional walls. Consistency is important with what we say we are committing to with our kids. There’s nothing wrong saying that it’s been a crazy day and it’s going to have to wait to later or even it’s just not possible right now. We don’t like to disappoint our kids, but when we’re juggling too much and we inadvertently layer it with an “I promise” it doesn’t lay the groundwork for anything positive coming out of the mix when, in the end, it’s another disappointment. Words- A recent quote I read recently kind of said it all, “Don’t say something permanently hurtful just because you’re temporarily upset.” Holy cow do our words resonate with our kids. Our kids watch, absorb and are impacted by what we say to them…. When we’ve been asked something for the fiftieth time in an hour, you’ve asked them to clean their room again for the millionth time or asking them to help you bring in the groceries; whatever the situation may be it can be hard to bite your tongue and not lash out of frustration or anxiety. Life can be stressful. Kids can make us crazy, on-edge and extra super stressed. The words that leave our mouthes in our most trying of moments stick with them; they stick to their hearts. It’s heavy duty stuff. There have been conversations I’ve had with kids who have reflected on whe they were called stupid, worthless, fat, ugly, not as good as another sibling, etc. that they will rehash at sixteen that they were called at six. Let me remind you, this isn’t a one time deal it’s words that compound one another. It’s repeating (even a handful of times a year): you’re stupid, an idiot, not good enough, etc. Even when we didn’t really mean what we said in any way, shape or form. It sticks. We are going to be frustrated, 100%. Know your words that you so very much wish you could take back, can’t really be retracted. Choose carefully. Maybe it’s asking for 10 seconds of quiet, praying for patience, counting to 30 in your head, walking away if that’s possible…whatever you need. Words hold power in our kids heart, super duper power. What we say, how we describe them….has a hand in shaping their self-image…. These descriptive words, whether we like it or not, will have a bearing on how our kids see themselves. When you are told you’re stupid, worthless or even a mistake those are hard descriptions to just shake off. In the midst of our most trying moments, find options to step away or de-escalate an intense moment. I will tell you, that split second of opting to duck out instead of ‘say’ is huge on our kids psyche. Kids can bring us joy and make us crazy all within the same sentence. Know that their minds, hearts an ears absorb everything. Be careful what you say. Think before you speak. This may sound annoying, but it’s a lesson for all of us. If these are things you do not struggle with, that’s awesome. The power of consistent parenting is great and can do amazing things. What are some areas you could improve? There’s always room for growth and learning. I promise. 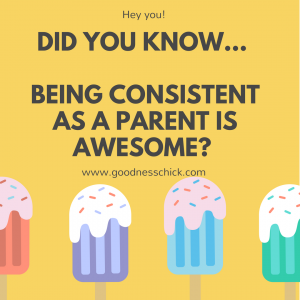 Check out my recent video post focusing on other areas of consistent parenting on Goodness Chick’s Facebook Page. I hope you’re week is filled with learning, re-aligning and re-connecting. Have an awesome one! Peace, Love & Goodness!